Reap the benefits of stainless steel wire rope when you choose this 12mm example of our popular 7×19 construction range. 12mm 7×19 Stainless Steel Wire Rope marries flexibility with strength and can be used in various commercial operations. Since this rope is made using AISI-standard stainless steel, it is more than capable of thriving in environments where it will be drenched in the rain, splashed by seawater and assaulted by other conditions. This will not only prevent corrosion, but also allow its exterior to look sleek and appealing for decades. 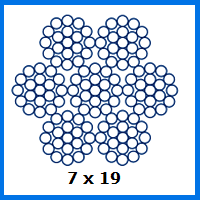 A 7×19 arrangement of the strands allows this rope to flex more easily than its counterparts, such as our 12mm 1×19 rope. This does slightly limit its sturdiness, but it still manages to achieve a WLL of 8,343kg and a breaking force of 81.8kN. You can use this 7×19 rope in whatever bespoke assembly you wish to order from Rope Services Direct. Leave the addition of ferrules, terminals, turnbuckles and other components to our team and see how easy accessing wire rope will become. If you do not think that stainless steel is the correct material to pick, why not take a look at our fibre rope range? It is just as diverse and customisable. You can get help from a friendly RSD representative by calling 01384 78004 or popping your details into our enquiry form. Even if you just want to ask a question, please get in touch for further assistance. 12mm 7x19 Stainless Steel Wire Rope Overall rating: 5 out of 5 based on 6 reviews.